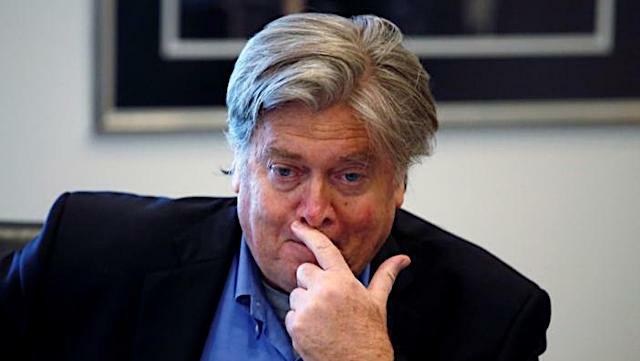 When an American White Supremacist like Steve Bannon is openly holding talks with key Tories, isn't it about time we addressed the Elephant in the Room ? Reuters reports that Trump’s former 'Political Strategist' Steve Bannon has had meetings with rivals to PM Theresa May - Boris Johnson, Jacob Rees Mogg and Michael Gove. Bannon, a former chairman of the right-wing Breitbart.com website and an architect of Trump’s 2016 election win, has launched a project to coordinate the anti-EU Vote (read: Far Right Fascist Groups) across the EU. Theresa May’s plans to leave the EU, which include Britain keeping a close trading relationship with the bloc on goods, have left her politically vulnerable. Michael has never had a meeting with Mr Bannon or discussed these issues with him. Bannon’s Right-Wing Foundation Is Planning to Hijack European democracy. In effect, it will be a Right Wing / Far Right Wing 'Axis', driving and supporting any group, any party, and anyone happy to jump onboard.